As movie bloggers, we all need to find the time and energy to juggle both tasks of watching a movie and then writing our review of it online. They can be very time consuming activities, so Anna (of Film Grimoire) and I have thought of a temporary solution. We would therefore like to invite you to join in and be a part of a new Blogathon that we are hosting this coming July. 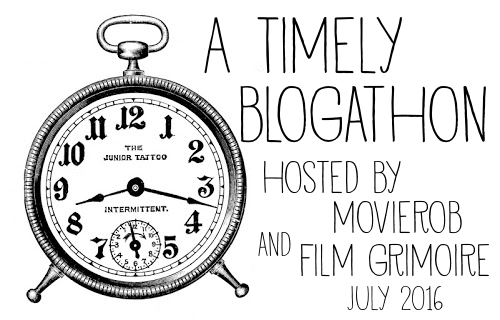 It’s a very timely theme and this Blogathon will be all about Time-saving movies, 90 minutes or less. You can pick any movie (or movies) that your heart desires as long as it’s official run time is less than 90 minutes. We don’t mind multiple posts of the same film and when we get the roster set, we will alternate posting the reviews on our sites. Let us know below what movie you’d like to review and then between now and July 1st, send us a review of the movie (or movies) you chose (to annachmbrs@gmail.com or 90minsorless@movierob.net) and we will post them throughout the month of July. If you have any questions, feel free to contact either of us and we look forward to seeing what you all have in mind for this fun Blogathon idea. What I meant to say is that I’m going to have a newborn baby so I think I’m out. Of course! That would be great!